I’m not an expert neither when it comes to soakwells but following this thread gives me an enormous idea about it. Thank you guys for this helpful discussion. Cheers! Hey Fu Manchu! Pic's for what I did for my rainwater ruin off can be found here - viewtopic.php?p=824769#p824769. Used your principles for the Ag Pipe instead of soak wells (was the most affordable solution for me) and I think it's turned out well. Haven't had any problems yet. Hi Sir Snagger, What you did was really great. I just saw the thread in your link and all was awesome. Cheers to you! we were even thinking about an underground rainwater tank for the water runoff (drive and walls) but these soakwells sound like it could be a decent alternative, and prob cheaper. Spot on with the work. It's not rocket science. It is hard work though. Hard work that stops any problems ever occurring in the future. It's when it wasn't done right in the beginning that the really really hard work comes about. Fixing drainage issues on an established home has knobs on it in comparison to a new landscape. hi oneness - can u pl pm me as to how much did they charge. I trust they dug them deep so there was in excess of 300mm from the top of the soak well to the surface or best to height of house slab? Plenty of peeps out there with a smile and a shovel, that will drop a soak well in quick and shallow. Nice to hear of someone doing it well... Soak well. The time has come for us to look at soakwells too, we should get the keys to our house next week. As we've been too busy preparing for the finishing touches we haven't been to the house in rain so I don't know how much water drains into each downpipe. I guess we'll during the next rain. I really like the idea of the poly cubes and also the ag pipe, however I have a few questions regarding the location of them. We've got two problem zones and I'm not sure what to do about them. I have a solution for each but would like to know whether there is a smarter solution to it. The first problem is the side. The side of our house is 1.5m away from a 1.5m high supporting wall whereby we are on the lower side of it. I have 6 downpipes over 30m on that side which I need to drain towards the back as the garage is to the front. These downpipes drain about half of our roof area, totally 350m2. My plan is to connect all 6 downpipes using 90mm piping and bring the to the back. Once clear of the house it will turn into ag pipe and then into some poly cubes, about 2m3. While I would like to put some poly cubes between the house and the supporting wall, I expect that the space is too narrow to be allowed to put them in. How is it with ag pipe? What distance does it have to be away from either of them? Would it be ok to use ag to connect between the downpipes, or is that not wise? Or simply too close to the structures as well? Any better suggestions on how to drain the water? Don't worry, I'll have grates between the downpipes and the drainage. The other problematic point I have is the garage. On one side there is a 1m strip which has one downpipe between the driveway and another supporting wall (20cm high), the property front is 6m away. While I don't expect a lot of water here, I still need to train it. The challenge is that we would like to plant trees here so I'm not sure this would go well with either ag pipe or poly cubes. The trees might damage the cube, and there might not be enough space there to put 20m of ag pipe down. Any suggestions on what we could do? So far the only solution I see is to put a 90mm pipe under the driveway and then drain the water on the other side. Sorry for digging up the old thread, but I thought it might be useful to ask the questions here. We are building a new house and builder says it needs engineered soakwells ($6k) because of the soil rating (s6). They say if we are going through independent contractor, still we'll have to follow their engineering report (we are fine with that) but they will take this out of their building licence. So if some structural damage happens to the house relating the soakwell, they won't be responsible for it (says movement of wall is common after few years). Is this true or just BS by the builder. Is there any real danger to structure of the house because of soakwells? I will be thankful to hear from you experienced people. How big are their proposed soakwells and how close are they to your footings? Possible structural damage? It's very early stage so I have not seen their proposed soakwells. However we want to follow their instructions; just need to know what are the chances of going wrong if it is done by an independent contractor e.g. SoakwellsRus. Anyone know if it has happened to anyone? Pm me the cost of getting the soak wells done please. I'm interested in soakwells too, who are the guys that most people use in Perth? Wondering if anyone can point me in the right direction. Using this guide, I installed my own soakwells a few months back. 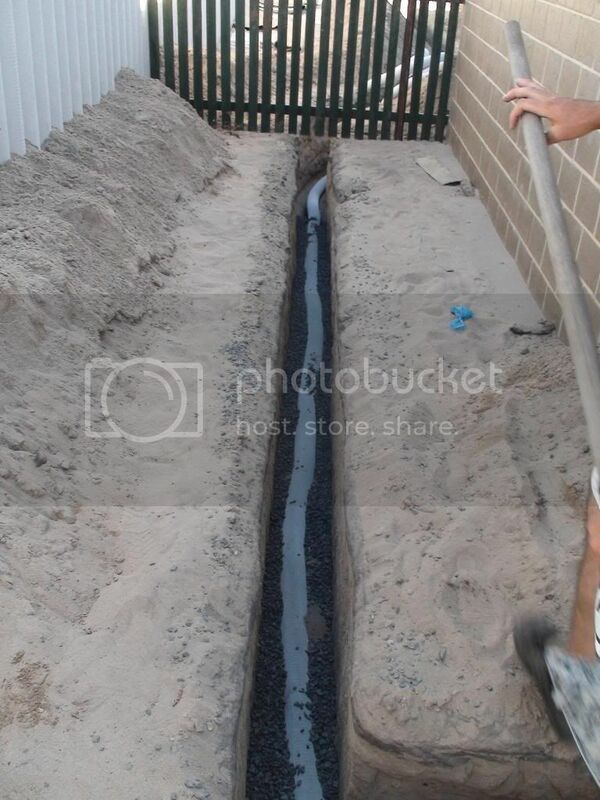 Pit in the back, pit in the front, with 90mm stormwater pipe connecting downpipes to the soakwells. My concern is that I have one downpipe that runs to the front soakwells. This downpipe is 'at the start of the line' so is the highest. The soakwells couldn't go any deeper than they are, due to hitting a heap of discarded road mix, so that has meant the first downpipe has to feed into stormwater pipe that is sitting quite high (and gradually slopes toward soakwells over 20m, picking up other downpipes along the way. Because of the height of this stormwater pipe at one end, it will have minimal soil coverage so it's open to traffic damage (feet/wheelbarrows only - but that's enough to crack if there's enough weight). I can't add much more soil above without impacting weepholes on the house. What are my options here? There is only about 1-1.2m between house footings and retaining wall footings, so I didn't want to put a soakwell there. I was considering replacing that high section of pipe (about 10m) with ag pipe in a trench with blue metal, but again worried about this being too close to the footings. 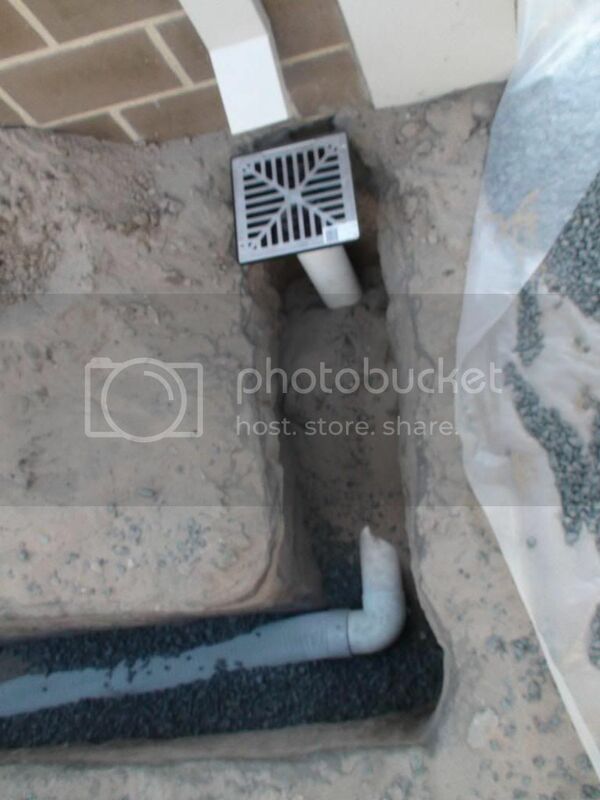 The other option is doing away with drainage and just put a spoon drain under the downpipe, but that would concentrate the drainage to one point which would nearly be as bad as a soakwell. So, would a socked ag pipe with a prepared trench - over about 8-10 metres - be sufficient and not cause any soil movement issues? We're only talking about one downpipe, however it is on the weather facing side of the roof. The soil is very sandy (Baldivis, Perth - yellow sand). Alternatively, is there some kind of heavy duty plastic or cement barrier that I could place over the top of the existing 90mm pipe before covering with soil to protect it from traffic? As the stormwater is connected and doing a fine job so far, the easiest option is to leave it where it is, as long as it isn't visible and can be protected somehow.